Atomic Minerals Directorate for Exploration and Research (AMDER) conducted successfully written exam against ADVT. NO.AMD-1/2013 for the post of Security Guard at various centres of HYDERABAD, BENGALURU AND NAGPUR. A huge no. of candidates had appeared in the exam. AMDER has declared the result of short listed candidates to attend the interview which will be conducted by AMDER officials. Those candidates who have applied for the posts and waiting for the result can download their result from the direct link provided below. o Atomic Minerals Directorate for Exploration & Research, 1-10-153/156, AMD COMPLEX, BEGUMPET, Opp. Hyderabad Public School, HYDERABAD-500 016. 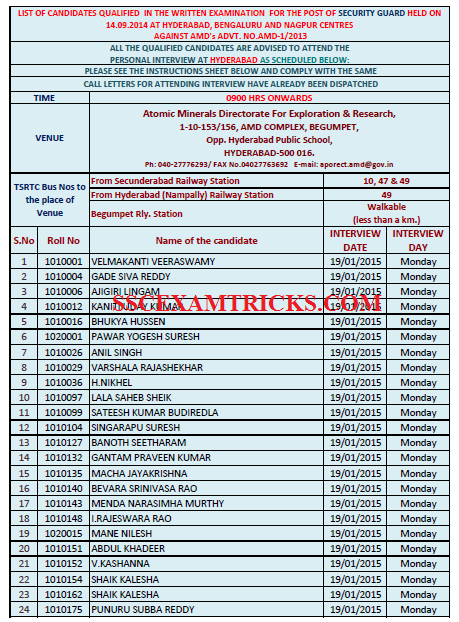 · Click on the link say ‘AMDER Security Guard Result 2015’. · A Merit List will be prepared based on the performance and released on the official website of AMDER.